Tiger eye, also spelled tiger's-eye and tigereye, is also called crocidolite cat's-eye or African cat's-eye. Tiger's Eye has, since ancient times been worn for good luck and protection against witchcraft and the evil eye. It is said to bring insight into one's own faults and to guide seekers towards right path. Used to help relieve asthma and high blood pressure. Colour: Golden brown, in bands or stripes of varying shades. Has translucent sheen associated with the cat’s eye, hence the name. 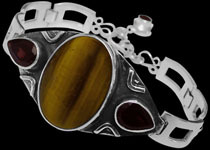 Our Tiger's Eye jewelry is guaranteed to be authentic and .925 sterling silver. 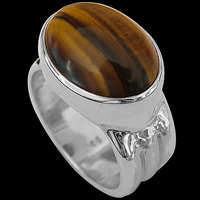 We feature Tiger's Eye Rings, Tiger's Eye Bracelets and Tiger's Eye Pendants. Our Tiger's Eye is the anniversary gemstone for the 9th year of marriage and make perfect Gifts for Graduation Jewelry, Mother's Day, Father's Day, Valentines Day, Anniversary Gift, Prom Night Jewelry, Bridesmaids Jewelry or as a Groomsmen's gift for that special occasion you wish to commemorate. To convert these silver jewelry prices to your local currency click here.